Whenever I serve this cake and later tell the guest that they were eating a healthy yoghurt cake with no butter, their eyes will open wide in disbelief. And their hand will reach for another slice to analyse it better. I have tried making cakes with yogurt and most often their texture is usually denser. This recipe however makes an incredibly light cake. It is almost like a sponge cake. 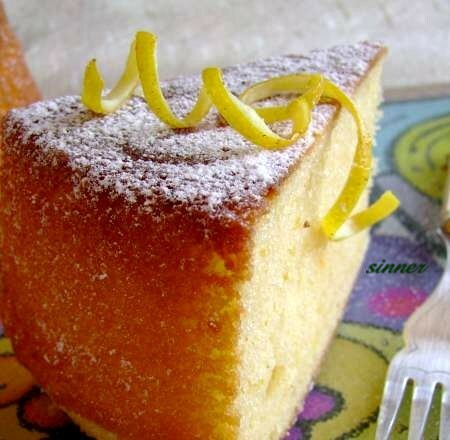 Very lemony and quick and easy to make. I can usually bake one in time for morning tea. As the taste is not boring, you can do away with icing the cake. 2) 21cm cake tin : bake for 45 minutes or until a skewer comes out clean. Cake height 6cm/2½". 26cm cake tin : bake for 35 minutes. The height of the cake is 5cm/2". These slices are from a 26cm cake tin. I can get about 20 'weight watchers' portions. Height of cake 2". Ready for free flow freezing. Healthy & delicious! can we use grapeseed or olive oil? Tricia - Thanks. Do hope you try this cake. Jenn - A neutral oil like sunflower or canola is better. Olive oil is a bit strong tasting and might come through in the lemon cake. I don't know about grapeseed as I have never had grapeseed oil before. This cake looks moist and delicious. And I do so like lemons in cakes. Thanks for sharing this beautiful healthy cake. I am so looking forward to try this out soon. I made this today but used regular yogurt instead of Greek yogurt. However I did strain out some of the liquid from my yogurt. The cake tasted good but I felt it was a little on the dense side. Did yours come out very light? I followed your method of mixing but I was wondering if the yogurt and oil should go in before the flour instead of after. 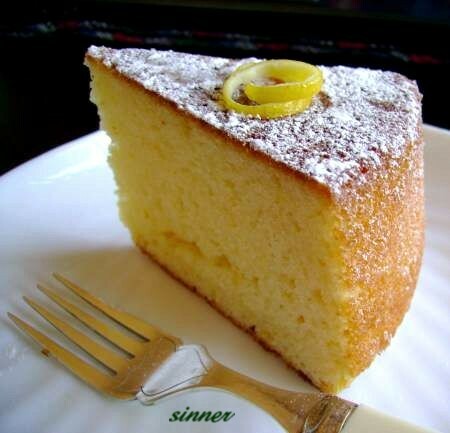 The cake is very light almost like a sponge cake if it is done right. The 1st time I tried this cake, it too came out dense and didn't rise much. Because we liked the taste of it so much, I tried it again, this time with bigger eggs (70-80gm each) and beat it for exactly 3-4 minutes until it was really light and fluffy. When I fold in the flour, I don't fuss - just fold it briefly like how you would a muffin mix, leaving it slightly lumpy. I did in fact have the same thoughts as you did about the yogurt and oil going in before the flour or even going in together. But believe me, follow the steps and you won't regret it. When you fold in the yoghurt, the texture of the mix changes and you notice it becomes lighter. Traces of the yogurt is still visible when I fold in the oil. Once the oil is in, then I fold it in more thoroughly but light handedly. I know the steps does defy logic but it works. I am glad I didn't flick the recipe the first time when it came out dense but was determined to try again. I bake this at least twice a month and is a cake I bring to any gathering as it is so easy to make. Has never failed me since. I do hope you give it another go. Thanks so much! I will definitely try the recipe again, but with larger eggs. And I will stick to your method, promise! Tried baking cake and it turned out dense. Also, cake did not brown and rise. Did you beat eggs by hand or did u use electric mixers? I used electric beaters and suspect may have overbeat. Do u think that was my problem? The cake looks so soft and moist! The cake do rise and it does brown. I bake mine in a small 22L Breville oven and mid way I even have to put a foil over the cake to prevent the top from further browning. The top 3 individual photos of the cake are from a 21cm cake tray while the bottom photo is baked in a 26cm round cake tray. You will note from those pics that all the cakes have browned beautifully and the texture light and soft. In the notes I have also noted how high the cake will rise to when baked in those cakes tins. I beat my egg and sugar (step 1 & 2) with a Kenwood Chef. The rest of the other ingredients are folded in with a spatula by hand. I do sympathise and understand your frustration. I love the sound of this cake & have it bookmarked to make really soon. It sounds gorgeous...& looks so too! i made this this past weekend as well and it's wonderful. i don't feel so bad about consuming more than a piece because i know it's relatively healthy. :) mine came out slightly dence but in reading some of your comments, i'll work on the mixing next time. There is a very similar french cake which is the first thing French kiddies learn to bake (the ingredients are measured in the little yogurt pots. I've made loads of different versions of it and it works very well with olive oil. It's lovely with the lemon. Just one question, can i use self raising flour instead? I don't see why not but you might have to work out the self raising flour baking powder component and add some baking powder. This yogurt cake uses a fair bit of baking powder. I followed your recipe exactly step by step, but instead of 2 large eggs, I used 3 medium ones. But the cake came out dense. The top of the cake browned well, but the middle part is still soggy and the top cracked quite a bit. I used 180C for 35 mins. i have the same problem as angela: the top cracked quite a bit and the middle was still soggy so i popped it into the oven for a bit longer at a lower temperature. it also came out a bit dense, not light and soft like yours. i followed your recipe to the t, including how long to beat the eggs and sugar etc. i did however use self-raising flour as that was the only type of flour i had at home. That's very interesting info. I do admit I buy the more expensive brand of flour and baking powder. My reasoning being, if I am going to go through all that effort in homebaking I want the end result to be worth it. Baking times given are an estimate only as each oven differs. With any cake, I will test it with a skewer (step 5). If it comes out clean, then it is done else continue baking until the stick comes out clean. I've wanted to try this cake, but only recently had the perfect opportunity. We were having a fun cake competition fundraiser (for the special olympics), to be judged by the Womens Institute (and boy do they know their cakes). This cake won me 2nd prize and everyone raved about it - so much so I have to make another for our coffee morning this week! The only thing I did different was a put a lemon glaze on top. To anyone thinking about making this cake - stop thinking and get it made - it is absolutely gorgeous. I made this yesterday afternoon, because I had some yogurt to use up. My husband loves citrus baked goods, so I thought it would be a winner. I used Pams standard flour, Edmonds baking powder, number 7 eggs and real vanilla essence. I beat the eggs and sugar until they were pale, almost white, and fluffy. When I folded the yogurt and oil in I cheated and did it together, and quickly folded it all in, with some lumps in it like muffin mix. The cake came out perfectly! It is very light, just like a sponge. It is pronounced "delicious" by my very discerning husband. I'm stoked it will freeze well too, as we try to not overeat stuff with processed sugar in it. CONGRATULATIONS ! Wow....2nd prize. Well done. And thank you so much for letting us know about your wonderful win. It is so good to hear some positive comment for a change. I just tried this recipe yesterday. It turned out delicious but my cake didn't rise like yours. I wouldn't say it is dense but it just didn't seem to rise at all. Is it because I used wholewheat flour (2/3 all purpose flour & 1/3 wholewheat)? Thanks for sharing such beatiful pictures and wonderful recipes. I tried making the cake this morning cos' my son saw the picture of your delicious looking cake and wanted me to make it for him. Instead of plain flour, I used Cake Flour and 3 eggs of 60 gm each as I did not have 2 large eggs. I followed the rest of the recipes as instructed. I wonder if you have any comments/advice? I really wish to try again by this weekend and hopefully to give you some positive comments. So glad you liked this delicious yet healthy cake as well. Really appreciate your positive feedback. It would be a bit hard to pinpoint the source of your problem with the cake as you have both substituted plain flour or part of, with something else. I wouldn't be able to say exactly why some of us have had great success with baking the cake and yet others not so. All I can say is 'don't give up'. This recipe does work ! Great looking picture! Your cake looks yummy too! I linked your blog in mine, I hope you don't mind...! Cheers - Cookinggallery. You are most welcome to link to our blog. Your blog looks great. Welcome to the blogging world. Finally tried yr cake yesterday. I didn't have castor sugar, so I used brown sugar. I didn't have lemon, so I used lime. The cake came out darker ... from using brown sugar. Smell and taste was great! My only problem ... and I stress is MY problem I am sure was it wasn't cooked all the way through ... guess it was from all the "checking" I did bcos it smelled so good ... also my husband and son kept on asking me if the cake was ready ... (always nice to blame someone else!!!). Though I did use a stick to check if it was ready ... I used a toothpick, which in my case was too short ... it didn't reach the bottom!!! LOL!!! Will definately make this again bcos it's healthier ... like my husband said, "That means we can have 2 pieces instead of one!!!" Love this recipe, so light and moist! I just posted an adapted version on my blog =) thanks for the recipe! So glad you tried the cake. It will bake faster if you have a wider cake pan. Been MIA as I was on holiday in Msia. Bought myself a Canon 450D slr camera and been busy trying to learn which button to push ! It is winter here at the moment. Cold and wet. So glad you liked the cake. Thanks for the feedback. I made a gluten free version of this cake for the first time today and at first I thought I must have over drained my yoghurt or something. The batter turn out quite thick & almost stiff and the top stayed rough as it bakes. So I went on to read the comments and see that for a lot of people, it comes out dense and didn't rise much and I was thinking I was in the same boat. But I left it in the oven for longer (coz it doesn't look cooked yet...) and it started to rise (although in the end I think it sank back down a bit) and things got even better when I take it out of the oven, I couldn't wait before trying it, and it was just wonderful, a crispy crust with unbelievably moist inside!! It was just awesome! I just wonder if there are anyway of making my crust smoother like yours. I think the crispy crust I got came from the lengthened baking time. There was also a big crack on the crust. I bet you had a nice holiday in Malaysia! I got more yogurt for my 2nd try ... can't wait! I use my homemade greek yoghurt but I don't drain it. The batter is actually quite light not thick or stiff. And when it is poured into the cake pan, my batter top is lumpy and pimply like too but it smoothens out during the baking process. I take the lumpiness as a good sign - that means the flour, yoghurt and oil was lightly mixed in. Once the top of cake have browned, I cover it loosely with foil. That should help with not getting a thick and crispy crust. Thanks for your feedback. I am glad your cake turned out alright. Thanks. I had a wonderful time shopping - so much choice. I tried this cake last weekend, but I failed terribly, I used normal plain yoghurt and follow strictly to your procedure, I used large egg but I did not weigh it, the eggs used should be 70-80gm (with shell or without please), & normal all purpose flour & the batter was thick & stiff infact the outcome was crack terribly on top, hard & I think I have to try again. I do not know where goes wrong. This cake is very challenging isn't it ? lol The 70-80gm egg is weight with shell on. I don't know enough about yoghurt to comment on whether it would make a difference if using plain yoghurt. In your next attempt, just remember to treat the batter as you would a muffin mix. Do not overmix (from step 3 onwards). Lumpy is ok. Thank you so much for your advice, I will keep in mind, as for our plain yoghurt is quite abit watery, (I used Nestle brand) & sorry for late reply very busy lately. Thanks again. I baked this last night and brought it to my office for morning tea. Yes there was a crack the size of canyon crevice but it received good reviews. can you get it in a shop? does any shop sells yogurt cake? Just a thought, but I think the mixed results people are having are far more likely to be due to variations in the yoghurts used rather than flour, eggs etc. There are huge variations in sugar, protein and fat levels in yoghurts, even in between different brands of the smae style of yoghurt (eg greek, low fat etc). I'm intending to bake this cake using low fat natural, which is low ins sugar and fat, and has a relatively high protein and water content, I am expecting to get a denser cake as a result, but will let you know! i was googling yogurt cake when i came upon your blog. This looks really good. And no butter! I think i should make it today. Your skinny greyhound is one lucky dog. Glad your cake turned out great. Thanks for the feedback. Mm, just tried this out for my flatmate's birthday cake - very gooooood. when adding the oil was a bit scared as it looked as it it was not going to get mixed but would remain on top of the cake mixture but finally it settled into the cake.cake turned out great but found it a bit too oily.was wondering if the amount of oil could be reduced?? phoebe, no harm trying. If it doesn't taste good, you can always fall back on the original recipe. Glad the cake turned out great. If you do try the oil reduction, would love to hear the result. I have eaten several horribly solid lemon yogurt cakes in the past so wanted those flavours in a light cake. This recipe promised and delivered a light, fluffy cake that was absolutely delicious, beautiful, and easy to make. I used regular sugar instead of castor sugar, and I beat the eggwhites separately before folding into the other wet ingredients to incorporate more air. I folded the wet and dry ingredients together gently. To bring out the lemon flavour I glazed the baked cake while warm, with leftover lemon juice/icing sugar. I doubled the recipe, baked one in a springform tin and one in a bundt tin at the same time, and both turned out well. I am going to freeze a quarter of a cake to see if it can be frozen as the recipe promises. This recipe is definitely a keeper! Thank you very, very much. No more dense lemon yogurt cakes for my family. Might try filling it with whipped cream and a bit of lemon curd next time! Whipped cream and lemon curd sounds delicious. So glad your lemon cake turned out great. Thanks for the recipe. Baked this and hv few ques, hope you can help. - baked this with 3 tsp baking powder, which I measured out 15g, is it too much ? coz it gave me gastric after eating a slice. - i used 21cm and cake only raised to 4cm, is it failed ? - the cake texture is still a bit dense. I beat egg white separately and folded in at last stage. 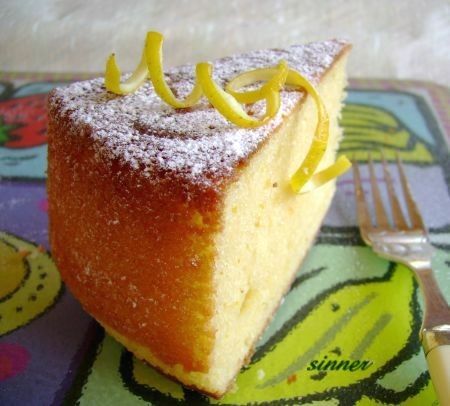 I glazed the cake with lemon syrup and the flavor is nice. Unfortunately only me and my mom like it. Just made the cake now and it has turned out perfect! Thanks for the recipe! Gorgeous, light and fluffy! I'd have to say beating the eggs and sugar for a while and folding in the rest of the mixture will definitely make it light and fluffy! So great to hear yours turned out great. I have baked your lemon yoghurt cake 3 times by now, the first time for tasting and the 2nd & third for helping someone fund raising. The taste is absolutely impaccable and the look, still room for improvement. I also made the roast duck, a bit dry but will definitely try a few more times. Making the salted eggs tonight, looking forward to tasting already. Van Tsang, thanks for the feedback. Roasting meat can sometimes be a hit and miss affair to get it just right. Hope the salted eggs came out good. Wow i cant beleive my eyes...have been trying to make similar cake but always the cake fail fall down and gets lumpy. This cake is amazing ,have followed ur recipe and it turned out very nice n fluffy hubby n kids loved it. So I was craving coffee cake. And I have heaps of turning Greek yoghurt. Made this cake. Nuff said. Was Delish!